A colourful way to begin your lunch! In this section sprouts, beans and greens take turns to bring in more iron and make a tantalising colourful and flavourful Iron Rich salads. Many of the salads here also use lemon juice as a part of the dressing. This high vitamin C rich lemon juice aids in the absorption of iron further. Try quick fix-ups like Bean Sprouts and Cucumber Salad with Lemony Basil Dressing, Black Bean and Bulgur Wheat Salad, Fruity Chana Salad and Lettuce, Orange and Spinach Salad. 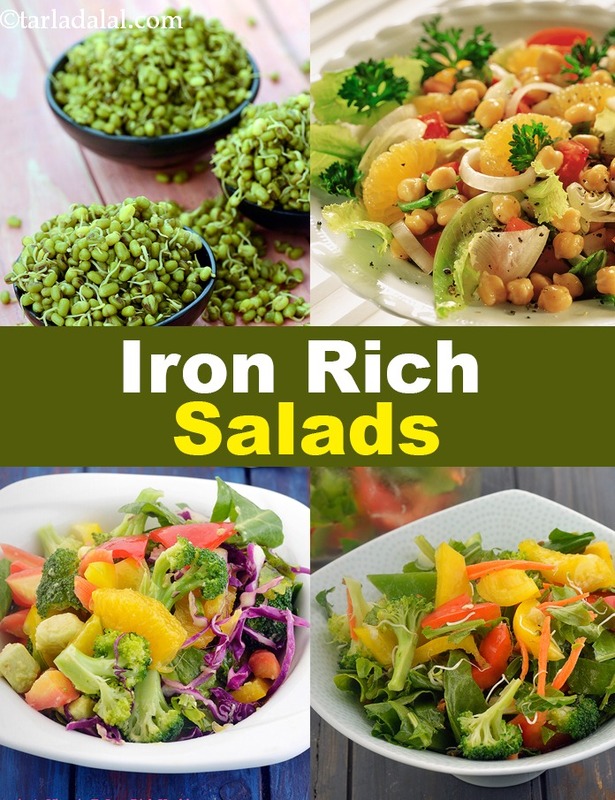 From light salads to filling salads which are loaded with iron, you will find all in this section. Protein rich rajma and chick peas tossed with roasted capsicum and Indian spices to perfection. Generously loaded with protein, fibre and other important nutrients like calcium, iron, zinc and vitamin C, this salad is an all-in-one treat for healthy skin as well as strong bones, hair and teeth. One of the most nutritious beans - chick peas are rich in iron, protein and folic acid. Curds enrich this tangy salad with more protein and calcium while coriander and mint increase its vitamin a content. Chill this salad before you serve it so as to relish its delightful flavours. Vitamin C rich orange and parsley helps to absorb iron (required for supplying blood to your skin) from bulgur wheat and sesame seeds.